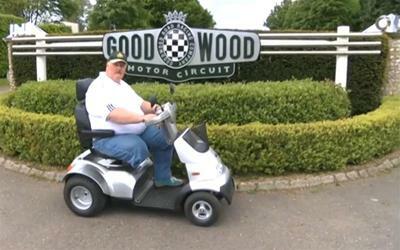 This weekend it was endurance and distance, not speed, that mattered most at the Goodwood Motor Circuit as Steve Tarrant, sponsored by Blue Badge Mobility Insurance, set out to break a Guinness World Record – the greatest distance travelled on a Mobility Scooter in 24 hours. And he succeeded! 190 miles in 24 hours, 20 miles more than the previous record. Steve is a familiar face at Goodwood and other famous Motorsport venues around the world as he is an international motorsport race marshal. In 2000 he was involved in a high speed collision resulting in the loss of a leg and multiple injuries. Since the accident Steve has continued to marshal at major events including Le Mans 24 Hours and was also actively involved in London 2012 as a medal bearing Games Maker. Steve is now waiting for official confirmation from Guinness that he will be entering the record books. As one of Steve’s sponsors Blue Badge Mobility Insurance will be supporting him in his future endeavours so keep an eye on us for more exciting stories however he has jokingly added “If you see me aboard a mobility scooter about to do another 24 hour challenge, you have my permission to shoot me!” And of course Steve uses Blue Badge Mobility Insurance for his Mobility Scooter Insurance. Blue Badge Mobility Insurance’s Managing Director Andy Chestnutt (left) went to support Steve at Goodwood.